The walks have been developed as part of the Essex Wildlife Trust's "Living Landscapes" project with the support of the Town Council. The aim of the walks is to explore the countryside learning something about its management and the wildlife that lives there as well as giving you the opportunity for some healthy exercise. Please click here to view the Series One leaflet. | Please click here to view the Series Two leaflet. Series two was launched on the 7th March 2015 and copies are available at the Town Council Offices or the Library. The cycle route, developed in conjuction with the Essex Roads Cycling Club is approximately 14 miles long, looping around Hanningfield Reservoir, via Stock and Ramsden Heath, providing some stunning views along the way. The route is based on 'B' roads and country lanes, enabling you to enjoy the countryside without too much traffic. A hard copy of the map is available from the Town Council offices and Billericay Library, or you may download by clicking here. 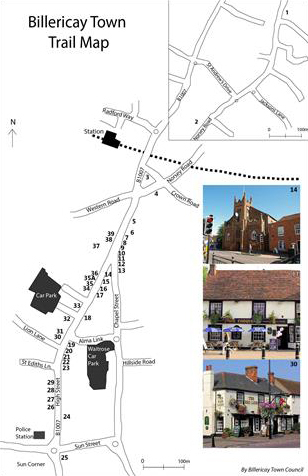 To view the Circular Walks brochure produced during April 2009 detailing four circular walks in and around Billericay please click here and for the details of the map please click here. Save on petrol and walk across the town. Our Healthy shortcuts show you the quickest ways on foot using quiet streets and footpaths. All the shortcuts have direction signs along the way so you won't get lost. To view the Healthy Shortcuts Map please click here. To find out more about Norsey Wood please click here. To download the Norsey Wood and Nature Trail Leaflet click here. Billericay is home to many historic locations and notable buildings which can now be appreciated though the town trail guide. You will find a plaque on the exterior of each building numbered on the Town Trail Map. Along with the map there is also a Town Trail Guide that gives a brief history for each location and building. Cliquez ici pour francais.